You’d almost think Arizona had decided to brand all its Hispanic residents with a scarlet H. That’s how ferociously the American left (and even the near-left) has been reacting to Arizona Senate Bill 1070, the state’s desperate attempt to attack the spreading wildfire known as illegal immigration. Should Arizona police be authorized to stop illegal immigrants? Why was Arizona desperate? Simply because the federal government has done nothing to manage the ongoing illegal immigration crisis, other than propose a vague program that allows illegals to make a lawful transition to legal status — with full amnesty for their past offenses, of course. But meanwhile, who’s minding the border? The new law, signed by Arizona Governor Jan Brewer on April 23, calls for police to be more vigilant in ascertaining the legal (or illegal) status of the state’s residents. Current estimates place Arizona’s illegal immigrant population at just under half a million — not exactly small change for a desert state with one large city. Recent headlines have driven home the message that illegal immigration entails a shocking amount of Hispanic-on-Hispanic crime and abuse: “Immigrants Become Hostages as Gangs Prey on Mexicans“… “Smugglers Torture Illegal Immigrants in Phoenix Drop House” … “67 Illegal Immigrants Found in U-Haul” … Critics of the Arizona law should try living there before they jump to premature conclusions about racism and nativism. The bill went decidedly overboard at first, with its veiled implications that police could stop anyone who looked vaguely suspicious (and vaguely Mexican) at any time, for any reason. But within a week, the state senate modified the bill to rein in the power of the police: now their investigations would be restricted to suspects who had already been stopped for other offenses. In other words, aside from whipping out your driver’s license when the police tap on your car window after you’ve been caught speeding, you’re now expected to produce proof that you’re not an illegal immigrant. Could someone explain to me how that’s a violation of anyone’s civil rights? We’re not targeting immigrants, after all — just illegal immigrants. Lawbreakers. Is that a crime? Ever since the anti-immigration faction passed the bill, the anti-anti-immigration faction has been busy shouting at protest rallies, encouraging a boycott of the entire state and even pointing menacing fingers at baseball’s Arizona Diamondbacks, whose roster is roughly one-third Hispanic and whose owner emphatically did not support the bill. All well and good… yes, yes, we shouldn’t go out of our way to oppress people who are already oppressed. But let’s apply a little common sense here. Peter Beinart of The Daily Beast has labeled the crusade against illegal immigrants as the latest wave of hysterical American nativism. When right-wing Americans aren’t busy hating blacks, he argues, they hate the foreigners in their midst. Even legal ones. Would Arizona police question the immigration status of a blond, freckle-faced family if they were caught speeding? Probably not, because illegal immigrants from south of the border tend not to be blond and freckle-faced. “Ah, but that’s racial profiling!,” a conscientious liberal would protest. And that’s a legitimate concern. But if the occupants of the car happen to be dark-haired and copper-skinned (like me, for example), they have nothing to fear as long as they have nothing to hide. Simple as that. If I were questioned, I’d produce my evidence of citizenship, solemnly accept my ticket for speeding, bid the officer good evening, and ease on down the road (at moderate speed). It's not just a border problem, it's a national problem. I confess that the mass incursion of immigrants from a single, non-assimilating ethno-linguistic group makes me worry more than usual about the future of this republic. My apprehensions have nothing to do with the color of those immigrants. I’d be just as uneasy if we found ourselves invaded by an unrelenting stream of Russians, for example, who created a parallel culture in our midst, balked at learning English, caused the Russian language to sprout on packaging and public signs, formed a permanent underclass and produced two or three offspring for every one of ours. I think of the creeping Islamization of Europe, which makes me shudder. At least our Hispanic immigrants aren’t innately hostile to our society, but their presence will change it forever — and probably not for the better. Eventually we’ll come to resemble a traditional Latin American republic: a vast realm of impoverished workers and peasants dominated by a tiny, self-perpetuating ruling class living in luxury. Come to think of it, we’re already heading there even without assistance from our illegal immigrants. ← When Is a Genocide Not a Genocide? TK: I think the original wording gave the cops more freedom to stop “the usual suspects,” but it was quickly altered to restrict police action to the kinds of violations you mentioned. I don’t see what all the brouhaha is about, either. Some people on the left (and even the center) seem to think we shouldn’t place any kind of restrictions on immigration. (After all, we’re America: “Give me your tired, your poor…” and all that.) But we won’t survive as a nation if a single non-assimilating immigrant group expands to half the population. Some lefties see it as a justifiable reconquest of lands that were stolen from Mexico, but the problem isn’t restricted to the Southwest. Illegal immigrants are everywhere now: Maine, New Jersey, Illinois, you name it. I suppose the American Indians would tell us that we’re getting some of our own medicine (and they’d be right). But I’m sure the Indians would have prevented the conquest of their lands if they’d been able to. Opponents of this bill almost never mention that it is really a desperate attempt by a border state to enforce already existing, but unenforced, federal immigration law. Legal immigrants are already required to carry their immigration papers, i.e. green cards/student id, etc, in the same way we are all required to carry our driver’s licenses when we operate a car . It seems absurd to take the position that law enforcement officials cannot enforce the law, but that is essentially what opponents are doing. Priscilla: Absolutely — it should be obvious that Arizona is simply stepping in (where the Feds should have been all along) to control an out-of-control problem. But the left is totally characterizing this as a racial issue… an excuse for cops to profile poor Hispanics. Well, of course it always boils down to race for some people… but my hypothetical example of a Russian immigrant invasion should answer that issue. I told them I don’t mind being pulled aside at airport checkpoints for looking Middle Eastern. I have nothing to hide, so I’m never detained for more than half a minute. I feel as if I’m doing my part to ensure airport security. It’s even simpler for legal Hispanics in Arizona: they just flash their documents and they’re good to go. I was watching a debate (or rather, a shouting match) about the Arizona law on one of the news channels. They were discussing the issue of racial profiling, when one of the panelists asked, “What does an illegal immigrant look like?” Having grown up in Arizona and living in Tucson for 6 years, I immediately formed a picture in my head of “what an illegal immigrant looks like.” (Although, I don’t think that was the point the panelist was trying to make.) I wonder, does that make me a rascist? So, yeah, I can see where the left might think the cops will look for a reason to pull over someone who looks illegal; even if it’s a subconscious reaction on the cops part. Like it are not, human beings have an unavoidable predilection to arrange things into groups. On the same news cast, a line flashed across the news ticker that read, “Arizona law makes it a crime to be an illegal alien.” Uh? Who’s the genius who wrote that line? Hallie: The subconscious factor IS a factor, I’m sure. But a cop doesn’t know what speeding motorists look like until he pulls them over. That’s one example. In other cases, the cops might see the faces of the suspects first. There probably has to be a certain amount of profiling (conscious or subconscious) since the vast majority of illegal immigrants in Arizona are Latinos. It doesn’t mean the police should be entitled to question a family innocently enjoying a picnic. The revised law specifies (I’m pretty sure, as much as I can be sure of anything I read online) that they can grill suspects about their immigration status only if they’ve already stopped them for some other infraction of the law. I love that news ticker line: I have a feeling it echoes the prevailing view on the left. “Imagine! Their very existence is a crime now! What a racist society!” In their minds, illegal alien = Hispanic. Therefore, the law makes it a crime to be Hispanic! That’s how our liberal friends think. The conditions in Mexico these days do make it understandable that many are fleeing over the border to get away from the violence. The country that we are has always had a mixed feeling towards the immigrant populations that have come in – much of the “old South” was landowned by Irish folk that were not welcomed in the North. St. Patty’s Day in Savannah, GA is a annual gala. The richness of the Yiddish culture and its influence on the Northeast is fabled. What bothers me even as a liberal person is what seems to be an attitude that, unlike other ethnic groups that have assimilated here, the Mexican newcomers do not want to blend – to learn our language, to become citizens. I, of course, do not apply this to all. And not to all Spanish-speaking folk here. The population from Cuba who came in the 60’s did not have a problem with English or taking the oath, for the most part. Now, it seems we are not encouraging assimilation, because it’s economically better to leave the undocumented as is, for a good source of cheap labor. The pressure to become “legal” is much less strong than previous – which suits both the employers and the illegal workers. Promoting legality would curb this cycle – America’s blended character needs to remain. Perhaps that’s a bit right of center? My Irish great-grandfather wouldn’t mind, I don’t think. Bill: Yes, it’s worth acknowledging that northern Mexico is essentially a war zone now. I don’t know how much of the illegal immigration stems from a desperation to leave the violence behind, but it has to be a factor for some, at least. It doesn’t help that both Republicans and Democrats seem to be fine with the illegal immigrant problem. As you noted, Republicans don’t mind because they can pick up all that cheap labor for their businesses… and of course the Democrats welcome all those fresh new Democrat voters. 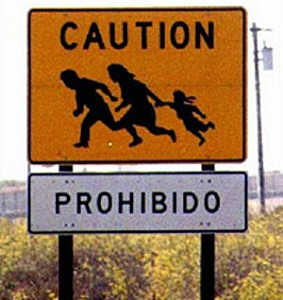 No wonder the illegal immigrants feel no pressure to become legal. Come now, Rick, you surely know that only U.S. citizens have the right to vote in this country. (No, I’m not a Democrat, but I don’t buy the idea that an entire political party is systematically encouraging voting by non-citizens.) You need to reread your phrasing: “Of course the Democrats welcome all those fresh new Democrat voters. No wonder the illegal immigrants feel no pressure to become legal.” Did you really mean to give the impression that illegal immigrants can vote? Whoops, you caught me asleep at the switch, Amontillada. (Good catch, too.) I didn’t think it through… though of course if the government approves amnesty for illegals (or even earned amnesty), you can bet there will be a lot of newly minted Democrats voting in the U.S.
Actually, in many states they had “same-day” registration coupled with lax or no citizenship requirements. By the time the person was verified/rejected, their vote had been cast. As voting is anonymous, there was no way of knowing which vote to remove. So yes, non-residents, illegal aliens, and others could (and did) all vote. Additionally most illegals are aware that if you have a child in the US, they are automatic citizens, and it is difficult to kick out the parents of a child. The party that caters to the parents will usually get the support of the child. In a mere 20 years, you have voters that have 2 elections under their belt for you. Yeah, I’d say Rick’s statement was spot-on. Hallie, the other day I heard a tv news reporter say “Arizona has made it illegal to be a non-citizen”…… bad news for foreign tourists or Arizonan families expecting visits from relatives who live in other countries, I guess! I guess what makes me crazy about this whole thing is this kind of “know-nothing” confluence of legal and illegal immigration by the people who are opposing this law, as if the illegality of sneaking into the country is somehow a side issue in this debate, instead of the central issue. If we were to close the border – really secure it, so that very few illegals could get into the country – I think there would be general agreement on legalizing and assimilating those who are already here. You must be a carpenter… you’ve hit the nail on the head. Thanks, LOUDelf. My upper middle class liberal friends would probably shun me for saying so, but there’s definitely a “noblesse oblige” factor here. I don’t think there would be such generosity of spirit if the illegal immigrants were, say, German or English. While I was on vacation I saw a headline about an illegal Mexican immigrant who was yanked out of her American college and put under arrest. Of course, the press chose to highlight this isolated story of an innocent student (although she had to be lying about her status) to stir up sympathy for illegals and animosity toward the Arizona immgrant law. I love how the press, instead of reporting the news, often slants or creates it. They try to show this poor girl who only wanted to get educated… yet fail to spotlight she either had to lie or commit forgery (or both) to get where she is. It’s like the CNN story about the married couple in AZ — she’s legal, he’s not. He has to leave the state, and she’s broken-hearted. Nothing about illegal entry, what job he took, how much services he used, or if he even files taxes legally. When can we just get information, and let us dumb folk try to figure out what we heard?